A new game has been announced for Xbox Live Arcade. 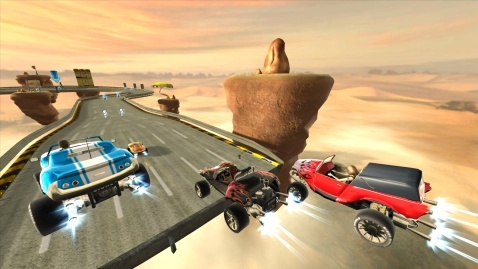 GripShift by New Zealand’s lead game developer, Sidhe Interactive. Wellington, New Zealand – November 28, 2007 – Sidhe Interactive, industry leading developer of cross platform titles, today announced that their award-winning driving platformer title, GripShift(R), is headed to Xbox LIVE(R) Arcade (XBLA), the premier destination for digitally distributed, high-definition original and classic games. Available this year, the Xbox LIVE Arcade-exclusive title features updated graphics, improved controls and additional single and multiplayer content, including new Challenge courses and a Deathmatch mode. – Veteran players and newcomers to the game will both find something to love in this definitive version of GripShift, said Mario Wynands, Managing Director of Sidhe Interactive. We’ve added a substantial amount of new content, including new single player courses and a multiplayer Deathmatch mode for players bent on dominating their friends or climbing to the top of the leaderboards. GripShift brings the action online to Xbox LIVE Arcade with an abundance of new content, including upgraded graphics, Deathmatch mode and new race courses. Additionally, unlockable achievements and TrueSkill Leaderboard functionality will keep Xbox 360 owners coming back to race their way to glory! GripShift will be released in the couple of weeks leading up to the New Year along with Arkadian Warriors, Brain Challenge, N+, Omega Five, Poker Smash, Rez HD, and Sensible World of Soccer. And now since the game has been announced I think I can finally tell you about my experience testing this game. Yes, I did actually get to test GripShift for the Xbox 360! I replied to a sign inside The Gamesman, asking for usability testers. On August 17th I arrived at the Sidhe offices. I had no idea what game I would be testing, but I turned up all the same. I met Gareth in a small office and saw a bunch of guys from Sidhe testing the game. Moving into an even smaller office, sitting down by a desk, with a xbox 360, television, refreshments and a camera to video my reactions or something. Gareth told me the game was GripShift and that they were bringing it to the Xbox 360. I had played the first PSP version and I soon experienced the massive changes the game had gone through. So basically, I was instructed to complete specific levels and go for the 3 basic goals of GripShift; the medal (bronze, silver or gold), the GS symbol hidden somewhere in the level and collecting all the stars. All the while Gareth asked me questions or I told him things I liked or disliked about the game. After the single player levels I had to try some multi-player races, with the guys in the next room. It was surprisingly addicted, in the PSP version the races were kind of the weak point of the game I thought. But here, the multi-player aspect worked extremely well and you really wanted to win. And then I got to try something that completely surprised me, deathmatch mode. With all new deathmatch type levels, and powerups scattered everywhere. You have to avoid falling off which was my main downfall, all the while avoiding been destroyed by your opponents.